Our Annual Meeting will be held next Wednesday, January 28th, 10am-12pm, in Keene. You should have received an invitation, but if you didn't let me know. Please RSVP by this Friday, 23rd if you haven't already - thanks! We hope to see you there! 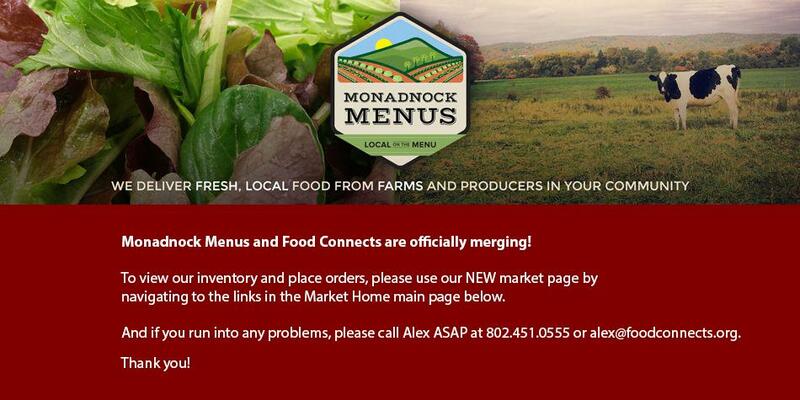 You may have heard Monadnock Menus on the radio last week. Aylmer Given III from Summerhill AL, Amanda Littleton from the Cheshire County Conservation District, and Courtney Hodge from Echo Farm Pudding, joined Luca Paris from Luca's Mediterranean Cafe, on his WKBK radio show, "What's Cooking with Luca Paris." If you missed it the first time, you can listen to the podcast here . Luca has invited Monadnock Menus to participate quarterly, so if you're interested in joining us for the next show (likely in May), let me know! New this week: red beets & kale! We have plenty of amazing produce that should be available through much of the winter: apples, carrots, cabbage, celeriac, sweet potatoes, potatoes, rutabagas, onions, parsnips, turnips, herbs, and more! We also have delicious bread, bagels, yogurt, pudding, cheese, maple syrup, granola, and local meat. **LAST CALL BUYERS: We have the ability to source some 10 lb boxes of frozen NH blueberries from Autumnview Farm in Pittsfield, NH, at ~$5.00/lb. Please let me know if you are interested. January Harvest of the Month is Parsnips! Check out the website for some great recipes and free educational materials for your cafeteria or shop. 2015 Harvest of the Month Calendars are available for purchase (and they don't say VT on the calendar month pages).